Optic nerve problems need to be understood in the context of eye anatomy and physiological functioning of the eye. The optic nerve forms the whitish/yellow knob that the physician sees through the ophthalmoscope or the slit lamp at the back of the eye. Physicians call it the “optic disc” or in Latin the “papilla”. This is where all of the nerves that collect information from the retinal nerve cells bundle together and form the beginning of the optic nerve. 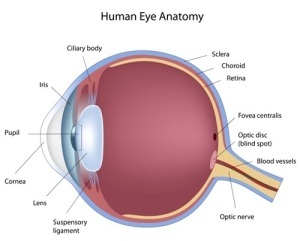 When the optic nerve leaves the eye ball (also called “bulb”) in the back, it is still within the eye cavity for a short stretch. This part of the optic nerve is termed “bulbar portion” or orbital portion of the optic nerve. This terminology becomes important when it comes to disease conditions. For instance, we will learn more about “papilledema” below, which is a swelling of the optic disc or papilla (=edema of the papilla) from high blood pressure. If there is inflammation of the optic disc, this is called “papillitis” (=”itis” meaning “inflammation”, therefore “inflammation of the papilla). Another term is “retrobulbar neuritis“, which is a nerve inflammation of the bulbar portion (=orbital portion) of the optic nerve. All of these conditions are explained under the links to this page in more detail. I will also deal with toxic amblyopia (blurred vision from toxins), optic atrophy (atrophy of the optic nerve) and interruptions of higher optic pathways at the optic chiasm and in the brain substance.